The last shop on this side was very old, it belonged to Mr. Sanders, a greengrocer. It was there as it is at the present time. We are now at 31 South Street, about to turn the corner, right, into Derby Road. On this corner are some thatched cottages and shops which were held by William Sanders, gardener, in the early years of the nineteenth century. He married Ann Raynor in October 1786 and the couple had at least ten children including Anne (born 1791), William the second (1796), Jenny (1801) and George (1809). William senior died in April 1812 and his wife in March 1820, both in their early 50’s. The properties then passed to son William the second though he surrendered some of them to his older sister Anne who lived in one of them until she died unmarried in March 1826. The 1841 census shows William the second, also a gardener, living there with his wife Lucy Sargeant (nee Mills) whom he married in March 1821. She was the daughter of William and Lucy Ann Paradise (nee Sargeant)…. note these names. With them are daughters Mary Ann (1822), Elizabeth (1828), Sarah (1834) and Harriet (1837). Lucy was then pregnant with the couple’s first and only son — William the third — born later that year. William the second’s brother, George, a cordwainer, is in another of the dwellings. The only other living sibling was Jenny Sanders who had married Joshua Harrison, framework knitter, in 1840 and was at Kensington. Brother George later went there to live with Jenny. After the death of William the second in 1860, his widow Lucy Sargeant continued to live in South Street with daughter Harriet and son William the third until her death in February 1863, aged 66. A few months later Harriet Sanders married coalminer Robert Bircumshaw and moved around the corner into Derby Road leaving William the third occupying the South Street home. He was still there at the end of the century, with his sister Harriet always close by. His living and domestic arrangements suggest that William the third was very content in this area. He married twice and found both wives without venturing very far. First wife Charlotte Henson whom he married in 1870 had been living across the road in Trueman’s Court, off the east side of South Street, with her parents, Loughborough-born boatman William and Elizabeth (nee Kitts). Charlotte died in Derby Road in December 1877, aged 32. 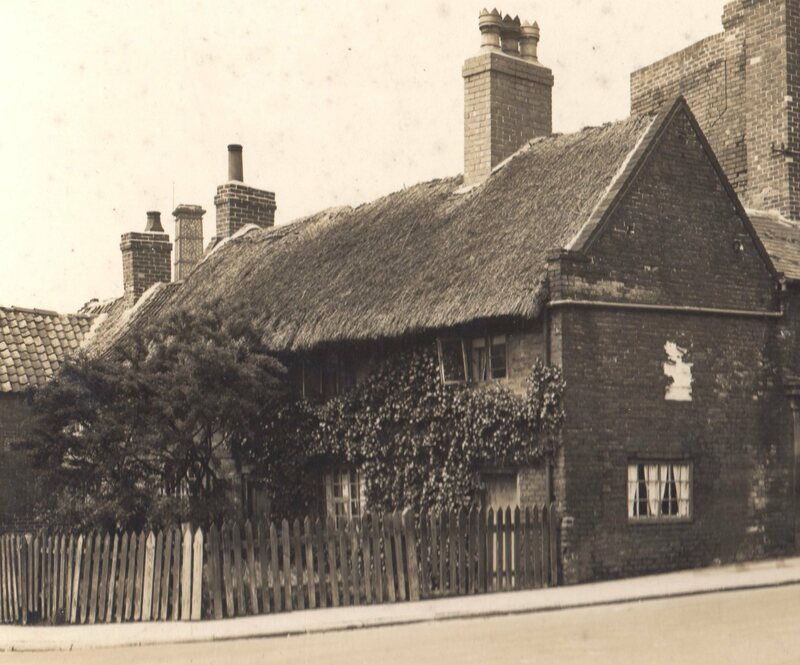 William’s second wife Jane Flint was the youngest child of shepherd George and Anne (nee Ford) and had lived ‘up the road’ in South Street, although at the time of her marriage in July 1881 she was with her brother William in Stanton Road. Jane lived in these premises for the rest of her life and died at what was then 66 Derby Road on New Year’s Day 1897, aged 46. Husband William died here in May 1908, aged 66. A couple of doors away was William’s sister Harriet and husband Robert. Thatched cottages at the corner of South Street (to the right) and Derby Road (to the left), about 1933. (courtesy of Ilkeston Reference Library).